The Transparent Apple Final Cut Pro X LogicSkin from Logic Keyboard was designed to fit exclusively on the Apple Full Size Ultra Thin Aluminum Keyboard. 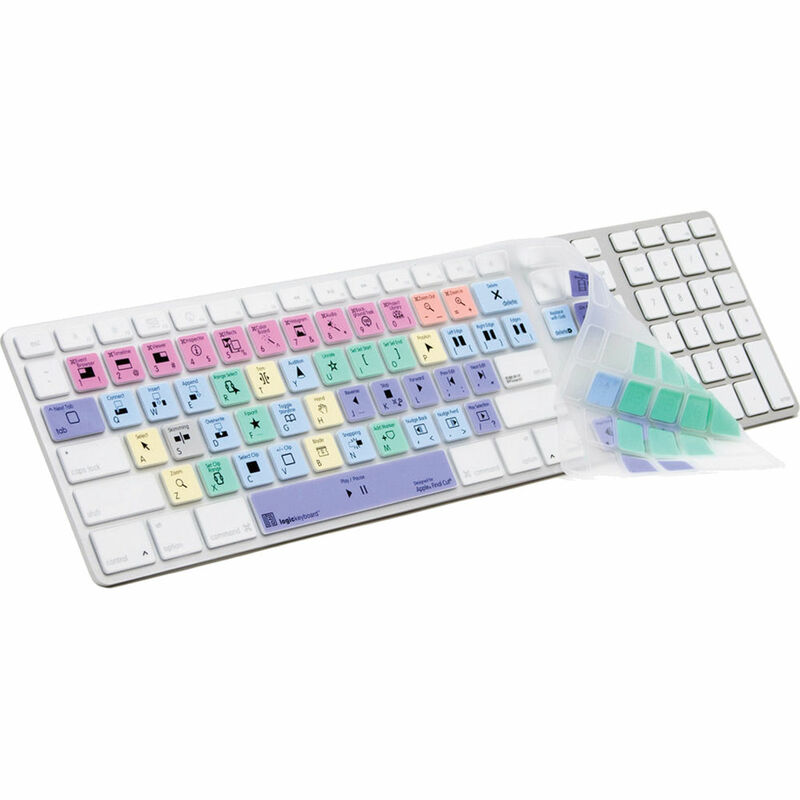 With custom key labels and shortcuts, this LogicSkin makes it easy to use Final Cut Pro X with greater efficiency. It is ideal for post-production facilities, professional video editing houses and anyone else who requires all the custom key commands to be readily available. This dedicated, clearly-labeled and color-coded keyboard cover is also an excellent teaching tool for novices trying to get a grasp of the Final Cut Pro X video editing program. Using this LogicSkin is a great way to learn the Final Cut Pro X key commands with ease. Box Dimensions (LxWxH) 5.9 x 4.7 x 0.6"
Transparent Apple Final Cut Pro X LogicSkin is rated 4.6 out of 5 by 5. Rated 5 out of 5 by aemilianius from Helpful for diving straight in This keyboard layout skin is extremely helpful if you have to hit the ground running with a new program like FCP X. I studied up and was able to speedily push out content the same week I started using FCP X. Very, very helpful. It does make it a little hard to touch type for emails, as an example, but it's easy to take off and put back on, so that's not really an issue to be concerned with. It doesn't get in the way during editing. Rated 3 out of 5 by Final Cut Guy from Fits... Kinda This does fit over the keys of the Ultra Thin Aluminum keyboard, however the responsiveness is not the same. Keys presses have to be a lot more deliberate, and I end up making more typos because it's not the feel I'm used to. I would suggest taking the skin off to type and only having it on when you are editing. Rated 5 out of 5 by Rob from Perfect Fit and a Great Time Saver! I haven't been using Final Cut for terribly long, so not super familiar with all the keyboard shortcuts. This was a huge timesaver to drop on the keyboard and give me the direction I need. It fits the keyboard perfectly and works well for normal typing even if not in Final Cut. Rated 5 out of 5 by basementape films from Great! Does what it's supposed to do! Not only does this cover help you with the shortcuts, It looks great and its a welcome update to the new FCPX workflow! Rated 5 out of 5 by ozieaev from if you are FC10 user - you'd love this LogicSkin. Its great ! protects my keyboard from stains and bring most useful shortcuts to your fingertips. Is it available in VF? Please email us at pc@&lt;a href= http://bhphoto.com target= _blank &gt;bhphoto.com&lt;/a&gt; for assistance with your inquiry.